Why does my black frosting look grey?? How can I make black buttercream that doesn’t turn my mouth black? Is there a way to make black frosting without loads of food coloring? How do you get you black buttercream such a deep shade? What’s the best way to make super black buttercream that actually tastes good? 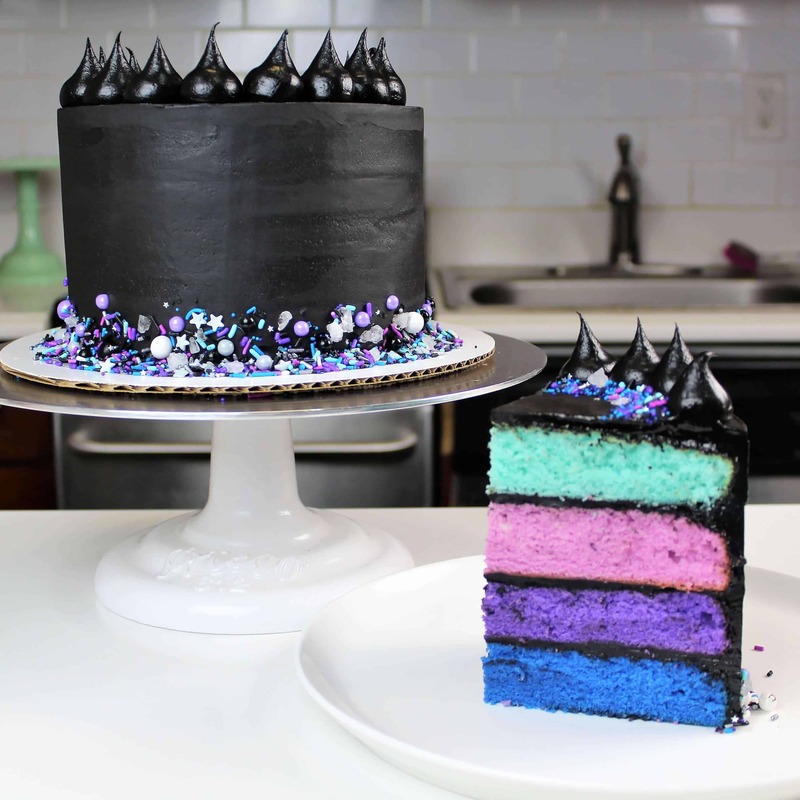 Which type and brand food coloring is best to use for black frosting? What’s your trick for making such black frosting?? To make our lives easier, I’m sharing my secrets to making super black buttercream frosting here! I start off using my classic american buttercream as a base, which is insanely easy to make. Next, I add my two secret ingredients: black cocoa, and gel food coloring. The finishing touch to my black frosting recipe is the magic of time!! That last line sounds hoaky, I know. As I typed it I couldn’t help but chuckle!! But I swear, letting this frosting sit is a sure fire way to deepen its color. Turning white buttercream black is incredibly hard. Starting off with a naturally deeper colored frosting base makes it about a million times easier. How do I like to naturally color my buttercream before adding in the gel food coloring?! Black cocoa, my friends. I only recently discovered black cocoa, and I’m obsessed. Black cocoa has a slightly higher pH than dutch-processed cocoa (8 vs.7), and is much less acidic than natural baking cocoa (5-6). The best comparison is to think of the bittersweet, chocolaty taste of an Oreo cookie! It’s absolutely delicious. It has a beautiful dark color, which helps build the perfect chocolaty base for this black frosting. Next comes the necessary evil, some food coloring. But I’m not talking about generic, black liquid food coloring. Liquid food coloring can also throw off the consistency of your frosting if you add too much. When it comes to coloring frosting, gel food coloring is a must. Especially when you’re after super vibrant or deep shades, like black. Gel food coloring is much more concentrated than liquid food coloring, so you can add less and still get the dark color you’re after! I always use the Americolor brand, which I purchase in big bottles from Amazon. When combining this small amount of black gel food coloring with my black cocoa buttercream, the result it amazing. You get a frosting that is a wonderfully deep shade of black, that tastes like Oreos and chocolate. My final trick to making black frosting is to make it ahead of time. Yes, time is my biggest secret!! If you make the frosting a couple days (or more) in advance, the color of the frosting will get darker over time! I swear it’s magic. This buttercream can be made over a week in advance, and stored in the fridge until it needs to be used. I take the frosting out a few hours before I need it, to allow it to come to room temperature. Once it’s thawed, it always is a darker color than when I initially made it. I have one important piece of advice around making frosting in advance. As buttercream sits and/or thaws, it usually gets tons of tiny air bubbles in it! Don’t worry, you’ll be able to make your buttercream smooth again. All you need to do is give the frosting a really good stir with a rubber spatula. Work the frosting slowly from side to side. Focus on spreading it across the sides of your bowl for a few minutes. It’s definitely an arm workout. But after working the frosting around the bowl and pushing out the excess air, you’ll be left with silky smooth frosting. How Much Frosting Do I Need For A Cake? Or Cupcakes? When using this to frost my vanilla layer cake recipe, I usually make 1.5 batches of black buttercream to cover a 7-inch or 8-inch layer cake. However, this can vary based on how I’m decorating the cake. If you were to use one batch of frosting to pipe buttercream swirls on top of cupcakes, it frosts about three dozen (36) cupcakes. Again, this cake also drastically vary if you’re making massive frosting swirls, or simply piping buttercream rosettes on top of each cupcake. 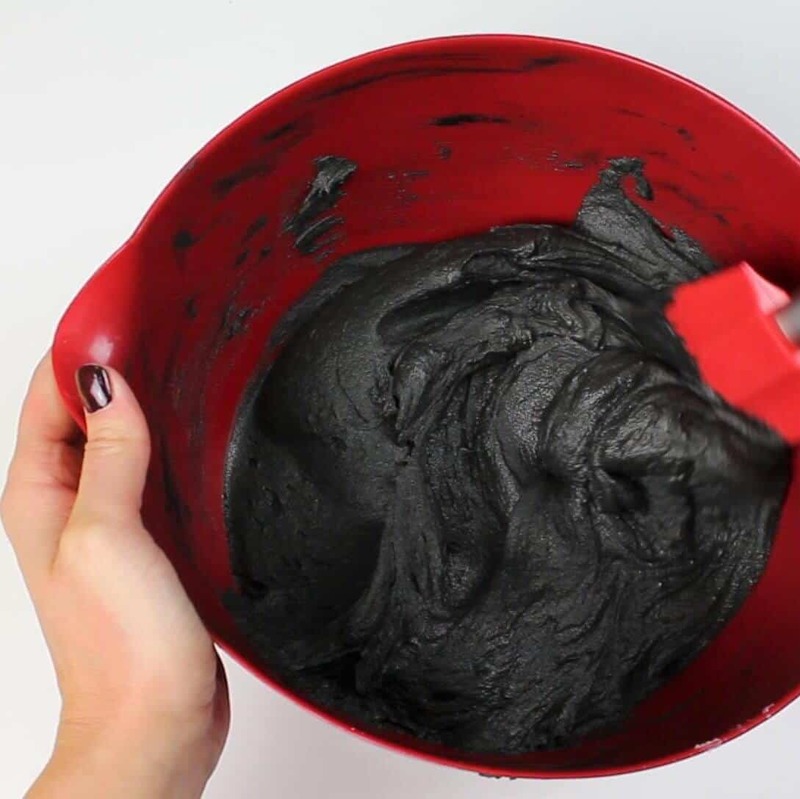 If you try this black frosting recipe, please tag me @chelsweets. Also use the #chelsweets so that I can see your amazing creations! Struggle to make truly black frosting?? Learn my tips for making the deepest black buttercream, with a simple recipe that comes together in minutes. Add in the sifted black cocoa or dark baking cocoa into the butter, and mix on a low speed until fully incorporated. If the frosting is too thick, add in additional cream (1 Tbsp at a time). If the frosting is too thin, add in more powdered sugar (quarter of a cup at a time). Add in a generous squirt of black gel food coloring (roughly 1 tsp) once the frosting is fully made, and mix by hand with a rubber spatula until the frosting is evenly colored. To allow the shade to deepen, place in sealed piping bags or an airtight container. Leave out overnight at room temperature, or place in the fridge for several days. If you are making frosting for a cake, it is important to mix the buttercream on the lowest speed at the end of the process for a couple minutes, to get out any extra air that might have be incorporated during the mixing process. If you have any questions about making buttercream in advance, please read this post on how long buttercream lasts and how to store it. Do you know the brand of Black Cocoa Powder you use? I found Wincrest on Amazon. Is that the right one? Yup, that’s the brand I use ? Does the black cocoa have a strong taste? 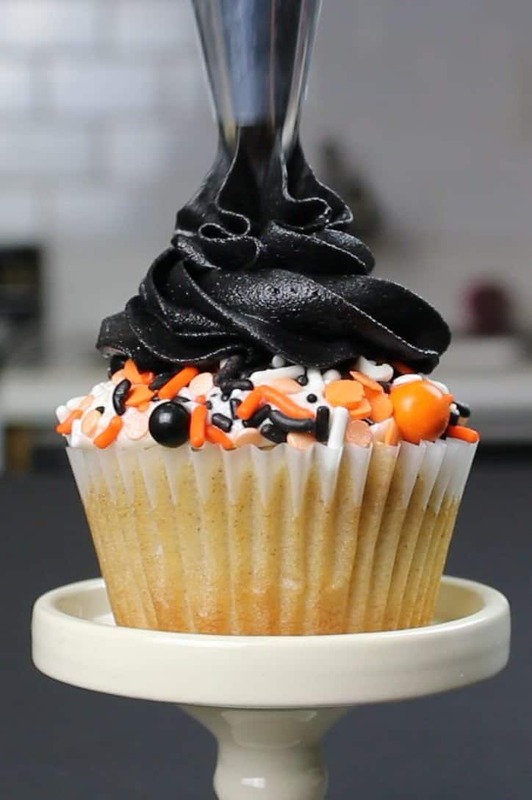 I’m looking to make a black cream cheese frosting without using a ton of gel food coloring. I’m wondering if adding 1/2 cup (maybe even 1/4 as I only need .5-1 batch of frosting) of the black cocoa to help with the color might really affect the taste? What are your thoughts? Thanks! it tastes like an oreo cookie, and definitely is chocolatey! I think it would taste good with cream frosting though!! I made the Black frosting yesterday and put it in a bowl in the frig and it didn’t get any darker. It isn’t as dark as your frosting in the red bowl(pictured above). Maybe I need more black gel, seems like I added a lot, but I’ll add more. Should I have let it sit out on the counter instead of the frig????? Thank you for these tips! Is there a particular brand of black cocoa that you use or recommend? Where can it be purchased? This is your vanilla cake recipe………..is that the right link? Thank you SO much!! I am just starting my baking business and just do it out of the home right now. I have been having such a hard time trying to figure out black frosting. Your videos are very inspiring and I have been able to use techniques that I’ve learned from watching your stuff!! Is this supposed to say 1/2 cup black cocoa or 1.2 cups? Just want to make sure I add the right amount! Do you refrigerate the frosting or just let it sit in the counter? You can do either! really depends on when you need the frosting. If I make frosting the night before and plan to decorate a cake first thing in the morning, I’ll leave it out overnight. However, if I won’t be using the frosting for a while, and will have to let it thaw the following day, or in a few days, I will refrigerate it. it’s basically whipping cream, it just has slightly more fat. Strange! I’d recommend adding a bit more gel food coloring!! How many cups of frosting does this recipe make? If I have one cup of buttercream frosting (not from this recipe) how much of the cocoa should I put in to get it black? It depends on how much air you incorporate into the frosting, but for me it usually makes about 5 cups! I’ve never made a single cup of frosting, but I would say you should add about a tablespoon! Thank you! I also followed your suggestion of leaving it overnight, and it turned a wonderful black! I’m actually making the Nightmare before Christmas cake! Hey Chels! Big fan of yours! I was wondering. I’m from the Netherlands and it’s really difficult to purchase black cocoa. So I thought. 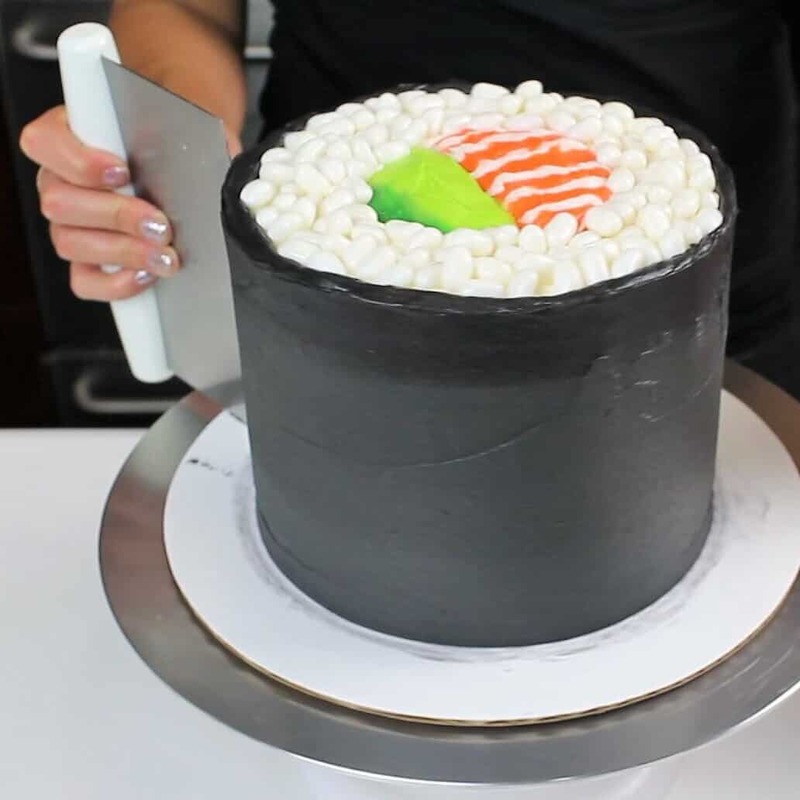 Isn’t it easier to (if you want your cake all black) cover it with black mirror glaze? You could pour a black glaze over a cake, yes! It’s just a bit more work to make a mirror glaze as well! I’d still recommend using a dark frosting underneath the glaze though! Hi, been following you on Instagram for a while and love your cakes. I am making a “mustache” cake, so I needed to make this black buttercream. I wanted to ask if the amount of cups of sugar is right on the recipe. Seems like a lot. 8 cups is 4lbs, and that turned out to be a lot. I couldn’t even put all of it in my blender, and I had to add a lot of heavy cream because it was way too thick. 8 cups of powdered sugar is actually 2 lbs! it is normally thick, but if you added 4 lbs of powdered sugar that is twice as much as you should’ve added! Does he black cocoa make this frosting chocolate flavored? What do you recommend for vanilla black frosting? it does! I honestly don’t make vanilla frosting that is black, because it takes LOADS of food coloring, and I just can’t handle how black it makes everyone’s mouth! but if someone really wants it, just be very heavy handed with the black gel food coloring. I use americolor, which I think works best! Hi Chels,huge fan of yours. Was wondering if you can use regular cocoa powder like extra brute cocoa barry? yah you def can! It won’t work quite as well, but will still help make a dark base to build off of! You mentioned using a butter from Whole Foods that is more white in color, I forgot the name of it. I hate it when the frosting is a cream color when you want white. It’s just the generic unsalted Whole Foods brand (not the organic kind)! The box is blue 🙂 Hope that helps! Will the black food coloring cause mouths to turn black like a vanilla black buttercream would? it is much better about that than vanilla black buttercream! it still will color your tongue a little bit, but it’s not bad at all! i only speak english, I’m sorry!! Hi Chelsea! First off, love your blog and IG tips. Now….my question is, if I were to use already made white frosting. Can I add the black cocoa powder to that and it would work? I ordered a lot of vanilla buttercream from a cakeshop…..what do u recommend? Thanks Erica! it can vary based on the base frosting you’re using, but it should work just the same! I’ve never used premade frosting before, but at the end of the day it’s all just fat of some type (butter or shortening or both) and lots of powdered sugar. So I think you should be good!! It won’t be quite the same, but it should work too! If I only needed a small batch of buttercream, what would you suggest?